Sir Andrew Harvey Armstrong was born on 23rd May 1866, the son of Reverend Sir Edmund Frederick Armstrong, 2nd Baronet and Alice Fisher. Shortly before the Boer War, his father died leading him to become the 3rd Baronet of the Armstrongs of Gallen Priory, Kings County. Gallen Priory also known as Gallen Abbey is a medieval monastery and now National Monument in Ireland, it was first established in AD 492, it has had a long and colourful history, the first Protestants to reside in Gallen Priory were the Armstrongs, of Scottish descent, their family name was originally Fairbairn, until one of the family, while hunting with William III of England, saved the King’s life by uprooting a tree and with it killing a boar which was attacking the king. The Priory was held by the Armstrongs for many years, being made Baronet in 1841 until it was sold following the death of Sir Andrew Harvey Armstrong in 1923, due to the troubles in Ireland and the deterioration of position of Anglo-Irish landowners in the early 20th century, Sir Armstrong chose to join the exodus from Ireland and in 1912, leased Gallen Priory to a convent, he then divided his time between England, mostly in London, Australia & New Zealand. When it came time to do his Military Duty during the Boer War, he joined the 61st Company, 17th Battalion of Imperial Yeomanry, the South Irish Horse Company, it was raised on 7th March 1900 at Dublin. He sailed from Southampton aboard the Galeka with 63 Officers, 1019 men and 53 horses for service in Rhodesia on 6th April 1900. 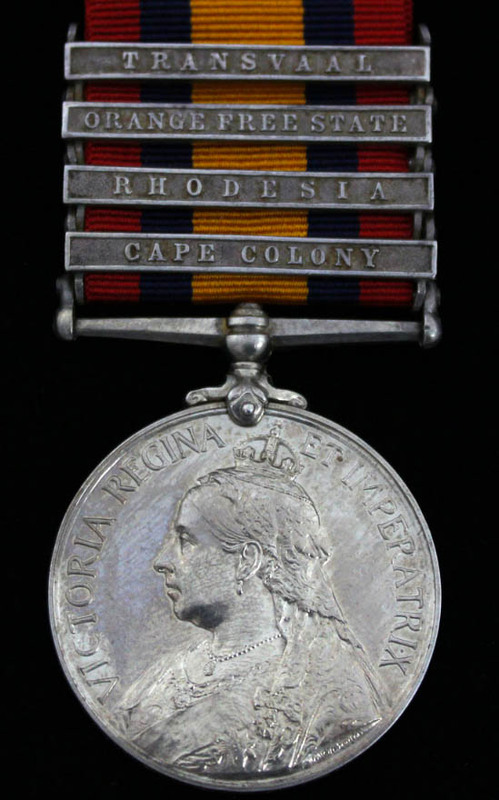 Following his service with the Rhodesia Field Force he returned back to England aboard the Pinemore on 15th March 1901, retiring from the army as an Honorary Lieutenant in July 1901. He served once more in WW1, joining the Connaught Ranger as a Captain at the Depot, relinquishing his commission after the war as Temporary Captain, returning to his rank of Honorary Lieutenant in the Army as of 10th December 1918. The Armstrongs were popular members of the community, Sir A.H. Armstrong became a Justice of the Peace (J.P.) and in 1914 was High Sheriff of King’s County. Sir Armstrong was cousin to Dame Nellie Melba GBE, a famous Australian Opera singer, who was one of the most famous singers of the late Victorian era and early 20th century, she had married at the age of 17 to Sir Armstrong’s brother and Sir Armstrong spent a lot of time over in Australia with them. By the time of his death, Sir Armstrong was well known in the Commonwealth, he was in Australia over Christmas 1921, the guest of Nellie Melba, when after the new year he went to New Zealand for some fishing. He was in failing health and passed away on 3rd June 1922 in a private nursing home in Auckland, he is buried in Waikaraka Cemetery, Onehunga, Auckland, New Zealand. He was 56 years old but was unmarried and had no heir, it was quite the surprise when a scruffy man claiming to be “Nesbitt William Armstrong” who had appeared before Sir Andrew’s solicitors “clad in clothes that had braved many a storm on vessels among the New Zealand coast”, he was indeed the younger brother of Sir Armstrong born in 1875 and then became Sir William Nesbitt Armstrong, 4th Baronet, the next year he sold the freehold to the family estate to the convent. “At the start of July, Nellie was obliged to put aside her ambitious plans for a few days and join Charlie in Ireland, where he had become a part-time lieutenant in the Prince of Wales Leinster Regiment. When his Military Duties ended, he and Nellie visited his brother, Sir Andrew Armstrong, at Gallen Priory. I sadly missed this one, but did manage to purchase the group to Captain Sir William Frederick Miller, Bart.